during her reign that the famous golf course at St. Andrews is built. 1867 The Ladies Club of St. Andrew’s, Scotland, is formed — the first ladies’ golf club. opened a 9-hole course for women two years later. 1895 The First U.S. Women’s Amateur championship is held at the Meadow Brook Club in Hempstead, N.Y.
1916 The Professional Golfers’ Association of America is founded. 1917 Women’s Tournament Committee of the USGA is founded. In 1934 it becomes the Women’s Committee of the USGA. she promotes products for Wilson-Western Sporting Goods Company. 1936 The National Golf Foundation is established to foster golf’s growth and economic vitality. 1938 Patty Berg, twice a runner-up, wins the U.S. Women’s Amateur at age twenty. 1941 Patty Berg Cup Defender “signature” clubs are introduced by Wilson Sporting Goods and become big sellers. 1944 The Women’s Professional Golf Association (WPGA) is founded. It is replaced by the LPGA six years later. 1945 Babe Zaharias plays against the men in the PGA sponsored L.A. Open, making two of the first three cuts. 1946 The first U.S. Women’s Open is conducted by the WPGA. Patty Berg wins. 1947 Babe Didrikson Zaharias is the first American to win the British Ladies’ Open Amateur. She turns pro later in the year. 1949 Marlene Bauer, age fifteen, wins the first U.S. Girls’ Junior Championship, and turns pro later in the year. 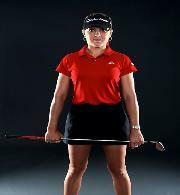 its first season, the LPGA included 14 events worth $50,000 in total prize money. 1958 Patty Berg wins the Western Open, her 15th major championship, a record. Foundation’s “think tank” that gathers for week-long seminars to discuss promotion and teaching of the game. 1961 Louise Suggs defeats a field that included 10 men at the $10,000 Palm Beach Par 3 Invitational. par-3 course in Las Vegas, playing from the same tees. 1963 First nationally televised women’s event – the U.S. Women’s Open. 1964 Mickey Wright wins 11 tournaments on the LPGA tour. of forward tees at Crooked Stick Golf Club in Carmel, Ind. 1969. “Big Momma,” is still competing as the oldest player on the LPGA Tour. 1977 The PGA of America votes to accept female members. tournament, breaking Mickey Wright’s record of 82. 1985 Kathy Whitworth wins her 88th LPGA tournament, the all-time record for official victories for women and men. 1988 The first issue of Golf For Women magazine is published. Graham, LPGA Teaching Division President, and Sandy LaBauve, LPGA Golf Professional. men compete head to head. She wins the Invitational Pro-Am at Pebble Beach in a one-stroke victory. 1990 The Solheim Cup is introduced, pitting professional women golfers from the U.S. against those from Europe. 1991 The LPGA Foundation is established to support junior golf programs and scholarships for girls. promote golf among working women. first national charity to partner with a professional golf association. 1996 Judy Bell becomes the first woman president of the United States Golf Association and serves two one-year terms. 1999 Aree Wongluekiet becomes the youngest U.S. Girls’ Junior Golf Champion at 13 years, 3 months, 7 days. match play in the U.S. Women’s Amateur Public Links Championship. Career Grand Slam, joining LPGA Tour Hall of Famers Louise Suggs, Mickey Wright, Pat Bradley and Juli Inkster. used for the event. Sorenstam and Woods defeat Webb and Duval on the 19th hole. asked to concentrate on Five Points of Celebrity: performance, approachability, appearance, joy, passion and relevance. make the cut, she draws record crowds and television viewers. Amateur Public Links Championship in Palm Coast, Fla.
generation – girls play sports; daughters can golf.